This stunning 2-CD set features innovative piano and orchestral arrangements. Linda blends traditional and contemporary Christian music with classical themes to breathe new life into your favourite hymns and worship songs. 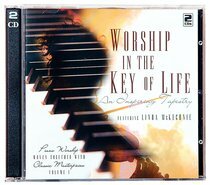 About "Worship in the Key of Life (Double Cd)"
McKechnie is a concert pianist. Customer Reviews For "Worship in the Key of Life (Double Cd)"
This is an inspired & anointed set of CD's which anyone who loves to worship The Lord would find to be an inspirational blessing. It is music that touches the very soul of your being.